It’s been really wonderful to expand our mushroom consumption over the last couple years. Just today I fixed a big stir fry made up of a lot of shiitakes. They’re nutritious and delicious! Just about every mushroom is medicinal and having my own organic source is a real delight. 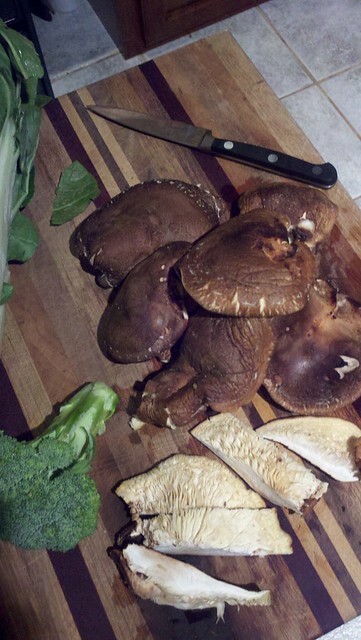 Shiitakes for dinner, fresh from the yard. 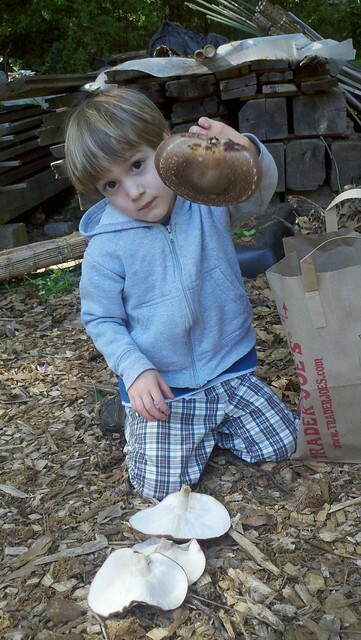 Alon showing off the shiitake harvest of the day, one by one. Mushroom logs are supposed to last between 2 and 5 years (some people say one year per inch o diameter on the log). It’s been two years since I innoculated my first logs and the logs have definitely changed! As you can see below, the bark is coming off and some of the logs are fairly degraded. Somewhat to be expected…these are my shiitake logs and most of the logs you see here are still producing (just finished a flush). After reviewing my logs, I found that 13 of the original shiitake logs were still producing with another 4 that might be producing still. That is about a 50% loss after 2 years. For the oysters, I might have a couple producing logs, but the situation is much worse. Seems that nearly all of them were lost last summer during the hot, dry spell (while I was traveling). In the hot, dry South, the mushroom logs need attention to keep from drying out. I keep a shade cloth over them and have them positioned in a fairly shady spot in the yard. If they get too dry, the mycellium inside will die and then no further fruiting will happen! That happened to several of my logs, and they were subsequently taken over by other mushrooms (not edible, unfortunately). To keep them from drying out, I soak them in trash cans filled with water a few times a year. With 12-24 hours per log, they get charged back up with moisture. This process also triggers the flushing of the mushrooms. 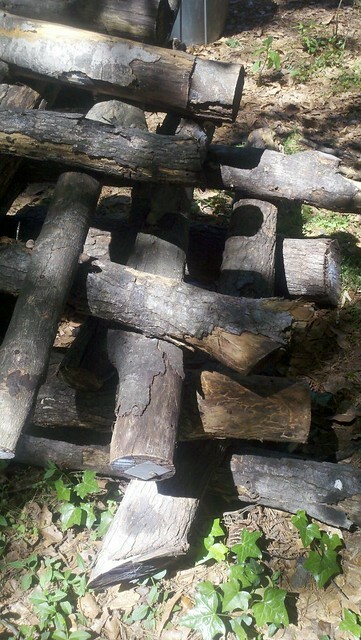 With the original 70 logs we innoculated, soaking them took nearly a week to cycle through in my two trashcans. And it was a lot of wasted effort, water and time to soak a bunch of logs that aren’t growing what I want…so this year I’ve done a culling of the logs. All the oyster logs will be retired and about half the shiitake logs. Now I’ve got about 20 logs to soak for a cycle. In addition, I’m moving the location to a spot more protected from the wind, slightly lower in elevation and (I think) a bit more shaded. Hopefully that will keep the remaining logs going! But with a serious reduction in producing logs, I figured it was time to expand capacity again. It takes about 6-12 months to get more fruiting from logs and early spring is the perfect time to innoculate logs, so I set about it again. 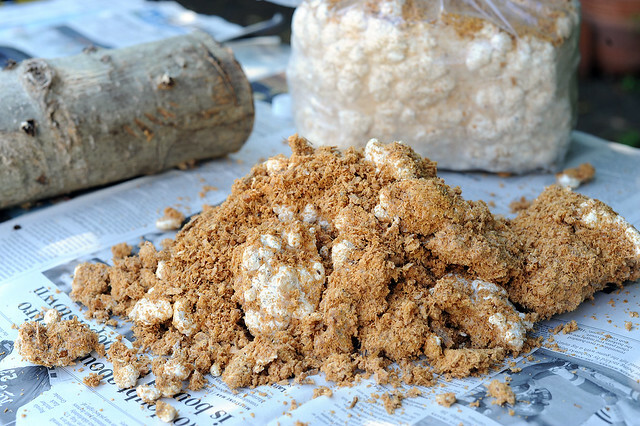 This year I went with sawdust spawn (from the nearby Mushroom Mountain). Sawdust spawn is just sawdust with mycellium growing on it (see below). It gets injected into holes drilled in the logs (instead of the – much more expensive – plugs). While the innoculation step takes longer (than just jamming a plug in), the sawdust is about half the cost of an equivalent amount of plugs. It’s also more conducive to cultivating new spawn, which I plan to do on cardboard, mulch, and more sawdust. My trusty sidekick Alon, now more engaged than the first time we made mushroom logs, operating the innoculation tool that pushes the sawdust into the logs. 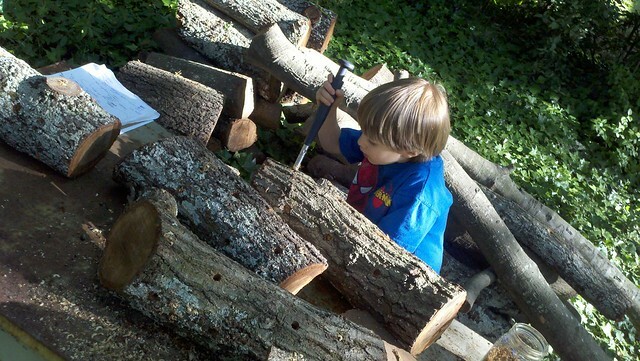 He declared it his favorite tool and offered to do that anytime I made logs :). In the first two days of innoculation in a few hours here and there, I’ve finished 18 logs, 12 with oyster mushrooms and 6 with shiitakes. Instead of the “lots of hands” approach, in which we busted out about 70 logs with 5 people in about half a day (see pictures and stats from that experience here), it’s mostly just me plodding along at it this time. The time per log is pretty similar (about 20-30 minutes), but I spent less money on getting the logs and a little more time preparing it. On a night when I tried a new first in the creative realm (no further detail until after the surprise :), I’m posting about another first for me this year – a new recipe. Or more accurately, a new dish that I am making, since I don’t really follow recipes very well. A couple of weeks ago, I was working in the yard and saw a lot of jelly mushrooms. 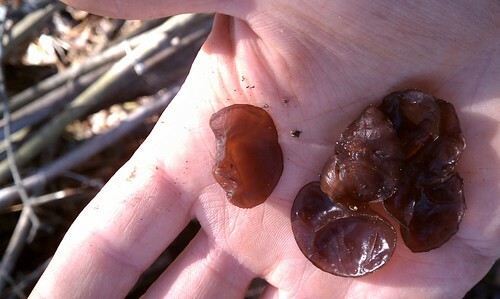 They are the jelly ones that are translucent and sometimes come in the shape of an ear growing on branches. We get a lot around the yard (when oak branches fall, generally have them) and I’ve been gathering the branches with these in our mushroom compost pile for over a year. They were in a massive flush! I walked around the yard with Alon (who wouldn’t let me get his picture) and we harvested a bunch (see pic)! These are in the order Tremellales , and there are no known poisonous in this order. Tree ear, Wood Ear, Jew’s Ear etc. I didn’t perform a spore print but the most common – though frequently not in the books – look alike is Exidia recisa, which has some info posted here. Related species is the a. polytricha (Mo Ehr), which is common in Chines markets and dishes, including Hot & Sour soup. Both the auricularia are edible and apparently have a very similar mild flavor. 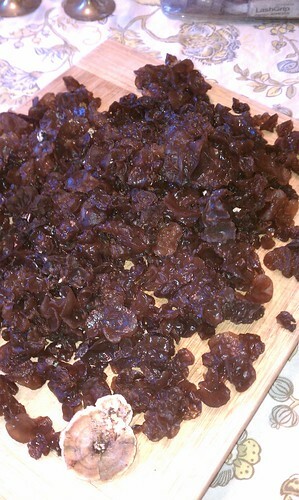 Auricularia species contain polysaccharides, which act as immune system stimulants and anti-carcinogens. These mushrooms are also reported to affect blood cogulation and may affect coronary artery health. Check this site (with references) for more mycological geek time. Given that this is a key ingredient in Hot & Sour soup, I just had to figure out how to make that! I found a recipe and modified it (on the fly, surprise surprise). I cooked it despite not having 2/3 of the ingredients! I even forgot the sour, and it was still really good! (when I cook something that makes Tirza very happy, it’s definitely worth paying attention to!). 1/4 cup dried black fungus (wood ears), soaked in water for one hour, drained and sliced. If you like your soup more brothy than chunky, add even more water (I’m still trying to figure out the ratio…I more than doubled what it called for and it’s still chunky). Note that all spices are approximate and should be adjusted to your pallet (I don’t actually measure anything when cooking this).Also, as a confession, I leave out the corn starch and didn’t miss it in the experience at all. Bring stock to simmer, add soy, shittakes and stray mushrooms, Sriracha/chili paste. Simmer for 10 min. Add white pepper, vinegar, bamboo shoots, water chestnuts, carrots, wood ear fungus, tofu. Simmer 10 min. Pour in the eggs in a very thin stream over the surface. Let stand for 15 seconds before adding the sesame oil. Serve with garnish of scallions. Hope you enjoy! If you have comments or questions, feel free to add them below.